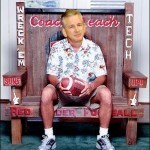 Tubswatch ’10: Is it down to 2 at Texas Tech? Double T 104.3, Lubbock's sports station, interviewed both interim head coach Ruffin McNeill and Tommy Tuberville today on the show "Tech Talk." (Click here for the link to the site. The story includes sound files for the radio interviews too.) A couple of interesting things to glean from the story online: 1) "Texas Tech Chancellor Kent Hance says McNeill and Tuberville … [Read more...] about Tubswatch ’10: Is it down to 2 at Texas Tech?